So I bought a first-generation iPad, Rochelle got an iPad 2 as a “spousal patience” present, and we both got “the new iPad (3rd generation)” when it came out in March. The retina display is amazing. Truly spectacular. Once you’ve used it, you will find it hard to go back to any other screen. Indeed, I used my original iPad less and less as I got more used to the retina display on my iPhone 4. I am already reading far more than I have in months, due to the crisp perfection of text on the screen. Both Apple’s iBooks and Amazon.com’s Kindle app are great for reading. When I can’t get DRM-free ebooks I tend to shop at Amazon.com first, simply for the selection, even though I probably prefer the UI for iBooks, marginally. It’s not just text that’s spectacular on the screen, either. I’ve…uh, checked out some of the comic book apps on the new screen, and it’s pretty much as good as holding a printed book. Spectacular. I’ve only used the Comics app from comiXology and the Dark Horse Comics app, but both have really delivered incredible on-screen quality. The original iPad was really heavy, for a device you’re going to hold in a reading or viewing position for long stretches of time. Reading a book, watching a movie, browsing the web—all great “lean back” activities on the iPad, but the weight, it was a killer. The new iPad is a little heavier than the iPad 2, but quite a bit less weight than the original. It’s still not light enough, but it’s an improvement. The new iPad does not get hot. No matter what you’ve read. It does get slightly warmer in a particular spot than the earlier models, but barely. You have to want to feel it to notice it. The new iPad does indeed take almost twice as long to charge. On the one hand, the battery has almost twice the capacity, so this is not a surprise. On the other hand, it’s a genuine limitation, in that it becomes much more important to remember to plug it in to charge overnight if you’re planning on using it heavily the next day. 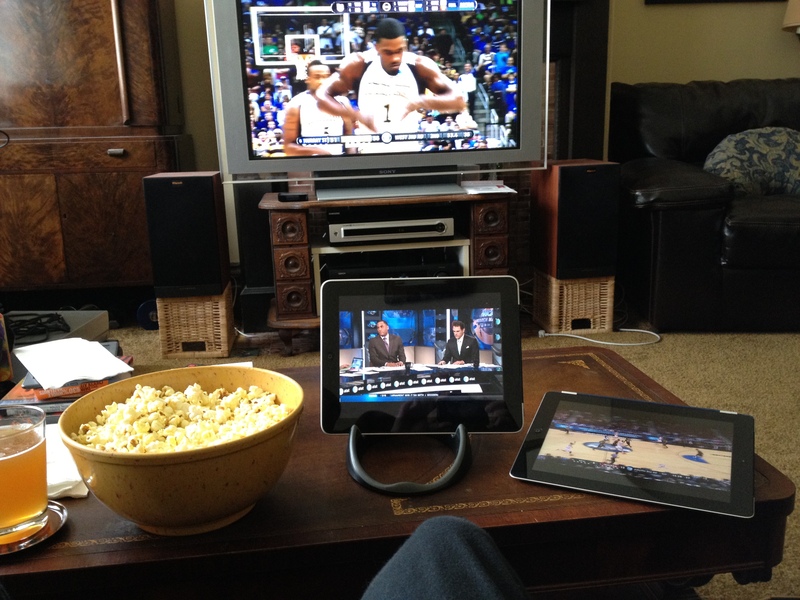 I used two iPads during March Madness, using the March Madness On Demand app to watch three games at once. The quality of the video, if not as good as my HDTV, was as good as my old standard definition TV set. Kind of amazing. The Netflix app is even better than that. Damn near HDTV quality. 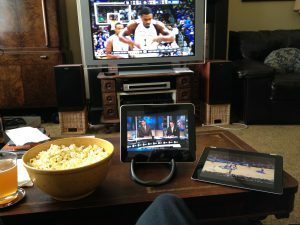 The combination of Netflix streaming for under $10/month and an iPad may let you kiss a $100+/month cable bill goodbye. (We haven’t subscribed to cable in 4+ years.) That’ll pay for an iPad right there, in less than a year. When we want to watch something that’s not available from those services (Justified, The Walking Dead), it’s not hard to justify renting or purchasing in the iTunes Store, given that we don’t spend anything on cable. Not available there, either? Patience is a virtue…we wait for it to be on Netflix’s regular old disc service. So, nutshell, worth it? As an upgrade from the original iPad, absolutely. The first generation iPad was interesting, even compelling as a vision of the future of computing, but for most people, I think it was easy to say “I’m going to wait for the version where they work out the bugs”. That wait is over. I don’t know what will come in future generations of the iPad, beyond more processing power and more storage, but this third-generation hardware is “fully baked”. The high definition screen delivers an experience that you do have to see and touch to fully appreciate, but once you do, you’ll want it, too. Page generated by WordPress 4.2-alpha-31516 in 0.526 seconds using 43 queries (postoffice.gristmillmedia.com).